On the Freightos Marketplace, the Shanghai-New York (PVG-JFK) air rates averaged $4.50/kg back in September. It had jumped to $6.50/kg by Week 45 (two weeks ago) and climbed up to $7.00/kg this week (when space was available). Ocean rates, never particularly strong this year, have peaked. It’s true that rates seasonally dip in December between Peak Season and the Chinese New Year, but chronic overcapacity means the dip came early this year. 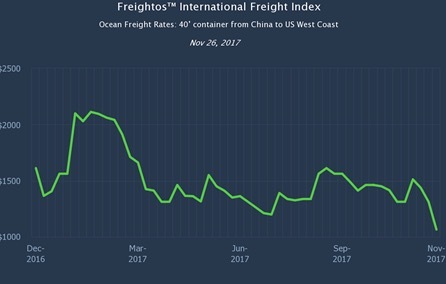 Ocean freight rates are down on last week on all China export lanes. They are similarly lagging year on year – China-US West Coast 42% behind, China-US East Coast 35% behind, and China-Europe 25% behind – in what are their largest gaps all year. In other words, this week’s rates are lagging further behind comparable last year’s rates than at any other time in 2017. In this context, it looks like the China-US December 1 GRIs (ranging between $600-$1,000) will come in very low, and even then won’t stick. Despite being well into peak season, China-US West Coast rates fell 19% this week and are at their lowest point this year. Similarly, China-US East Coast rates also at their lowest point this year, having dropped 11% this week. Space had been tighter on China-Europe than China-US lanes, but there are no capacity problems now. No wonder, rates dropped 12% this week. Space is tight on Europe-US East Coast lanes, their rates fared best this week (not moving) and are only 14% behind last year’s rates.